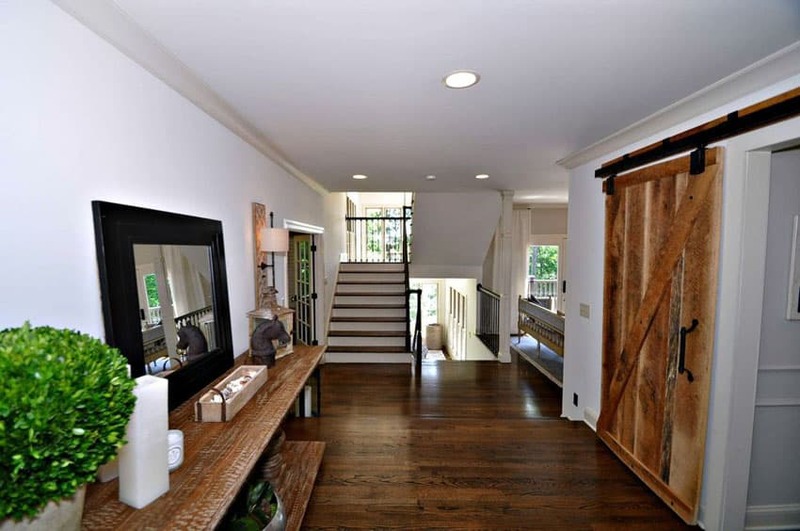 This gallery features interior sliding barn doors in a variety of styles and rooms within the home. 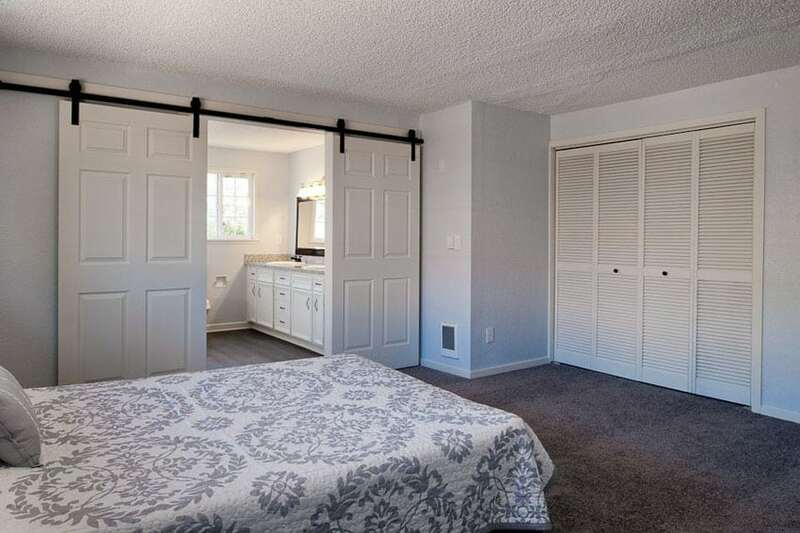 Adding a sliding partition style door to your house is a great way to separate and connect two rooms. 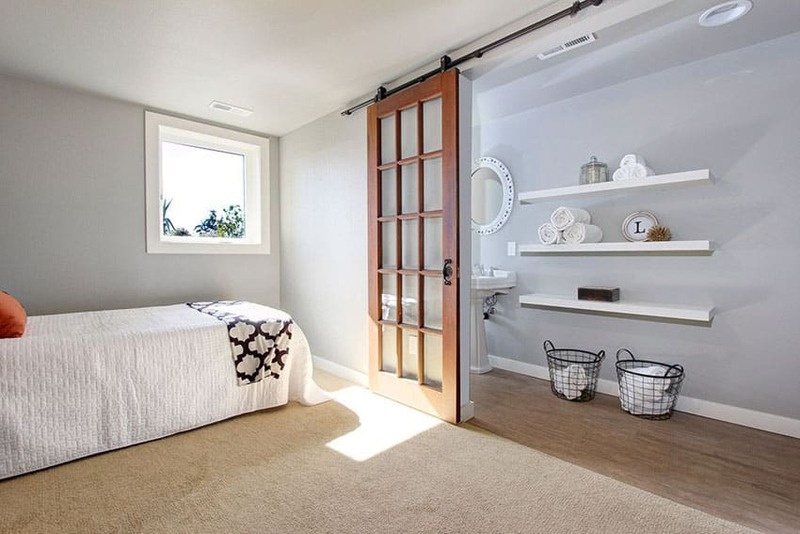 Interior sliding barn doors are an appealing way to increase the drama of your interior design and help you go from an closed to open room layout easily. 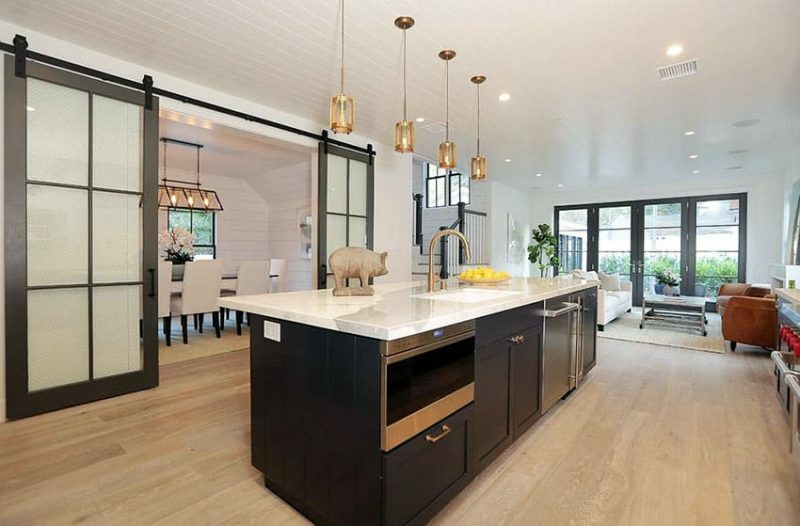 The picture above showcases a contemporary open kitchen design with a modern stylish sliding barn door. The sliding barn door is made of Engineered Alder which is a sustainable wood; currently used for a variety of specialty interior doors, furniture and floors. This simple sliding door design with glass panel is both a contemporary and an elegant way of separating the formal dining room from the kitchen. Yet at the same time, unlocks to feature an open concept scheme. 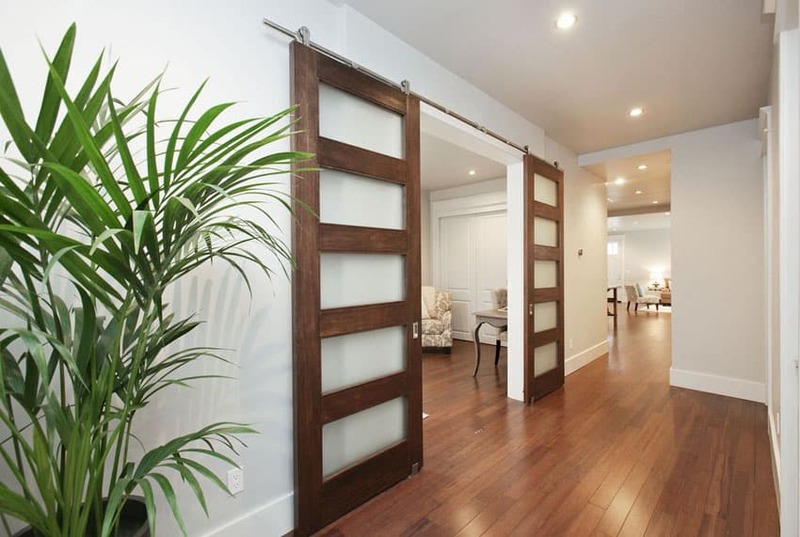 There are a wide variety of sliding barn doors to choose from. One can find traditional rustic style sliding doors to contemporary and modern models to fit your home’s style. Below we share a variety of sliding door designs that use a classic barn style for different rooms in the home. This timeless look of an aged wooden sliding barn door features a rustic textured finish, perfectly designed to complement the vaulted ceiling for this country style inspired home. Built from reclaimed wood, this Z sliding barn door design adds a lot of visual interest to the entryway leading to the kitchen and dining area. This sliding barn door with thin metal straps is made out of reclaimed wood in light tone finish gives this contemporary home design a rustic look and feel. Additionally, it is truly a space saver movable partition between the dining room and the kitchen without hampering the open design concept scheme. 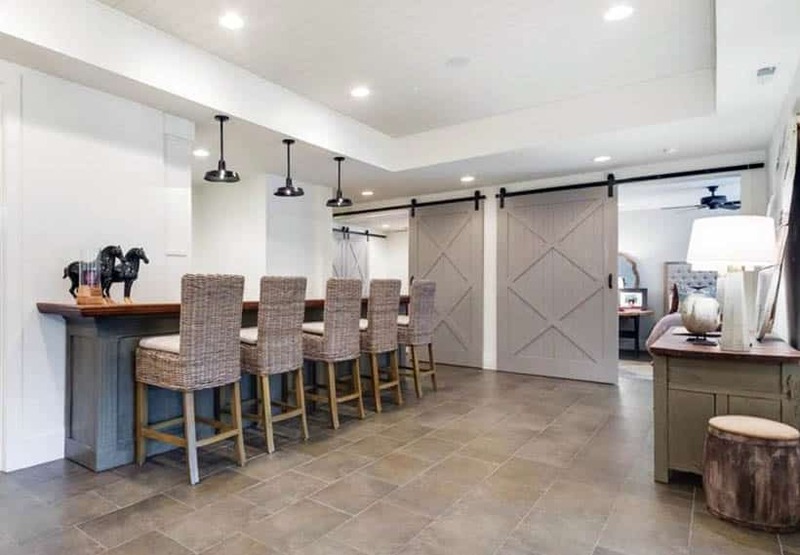 This custom sliding barn door features horizontal wood planks with a heavy duty wrought iron rail system and stainless steel strapping for support. A rustic inspired bedroom integrates a sliding barn door from reclaimed semi knotty hardwood with a stained light tone featuring a natural weathered look to compliment the bedroom’s neutral color scheme. The sliding door’s light metallic hardware is less heavy and bulky than the traditional barn door hardware and adds a modern functionality to the design. See more bedroom layouts here. 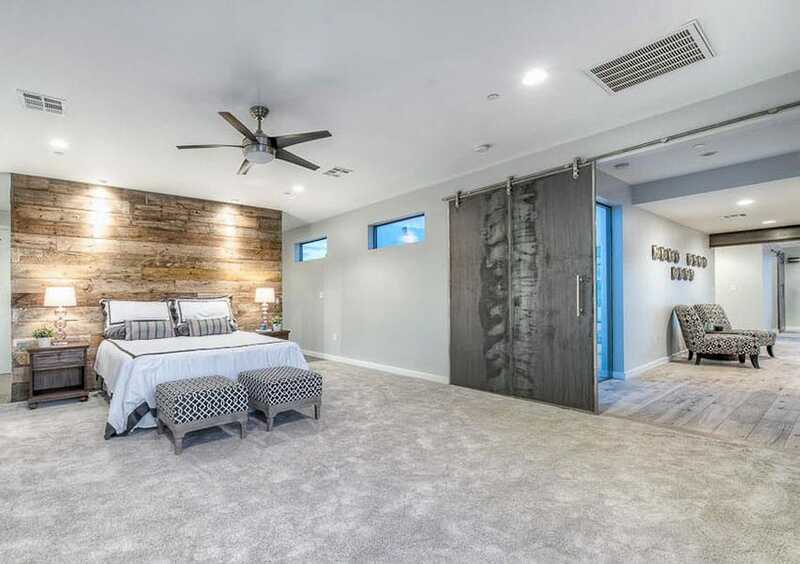 This master’s bedroom features a perfect blend of contemporary and craftsman inspired design theme by integrating reclaimed wood in natural finish for the accent wall, knotty hardwood flooring in light tone finish and using distressed sliding barn door in neutral tone finish with a modern and high quality design hardware. Neutral color scheme is observed as well in the furniture, wall finish and floor covering. Made from Engineered Alder wood this Z panel artisan sliding door works perfect as a wall accent when closed for that touch of vintage rustic feel to this otherwise, plain white wall in this living room. Neutral color scheme is highlighted by the dark tone finish of the sliding bar door and medium tone exposed ceiling beam; accented by the dark finish of the center table and gray striped curtain. 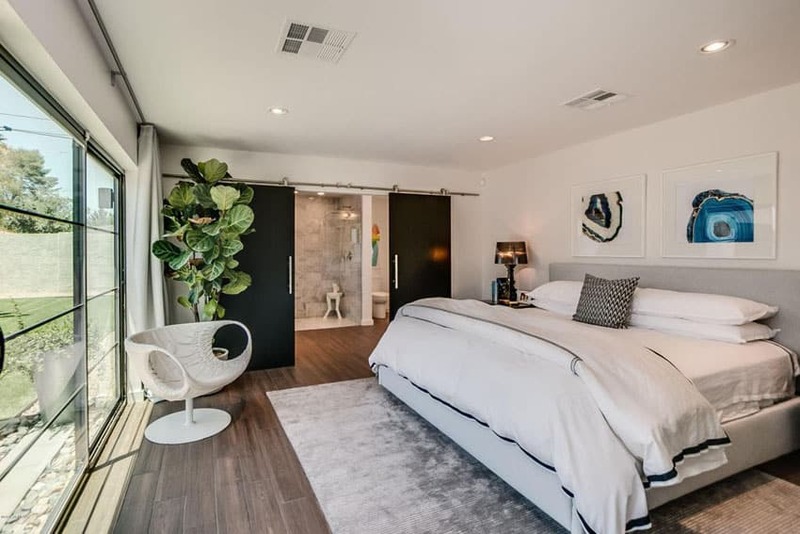 The modern fogged acrylic sliding door gives this master bedroom a stylish movable partition. Made with hardwood material in medium tone finish and heavy vintage barn door hardware that captures a rustic feeling with a smooth quiet roll which works well with this bedroom door design set up. This top mount barn door hardware combines a modern and contemporary sliding system which can be hidden from view by incorporating a beam which covers the top mount wheel. The large custom horizontal four panel barn door design is a contemporary twist on the usual classic panel designs and allows flexibility for additional privacy. This French style glass panel sliding barn door incorporates a top mount barn door system creating an appealing piece of hardware which is suitable for this type of door design. Perfect movable partition sliding door for this guest room and modern bathroom design. This two panel Z-barn sliding door made from knotty alder wood uses a thickened steel and ball bearing wheels barn door hardware for a smooth and quite roll. This combines the rustic and vintage with a transitional contemporary style design to this bedroom. The design concept is extended in the light tone hardwood flooring and wood panel wall in the bathroom. 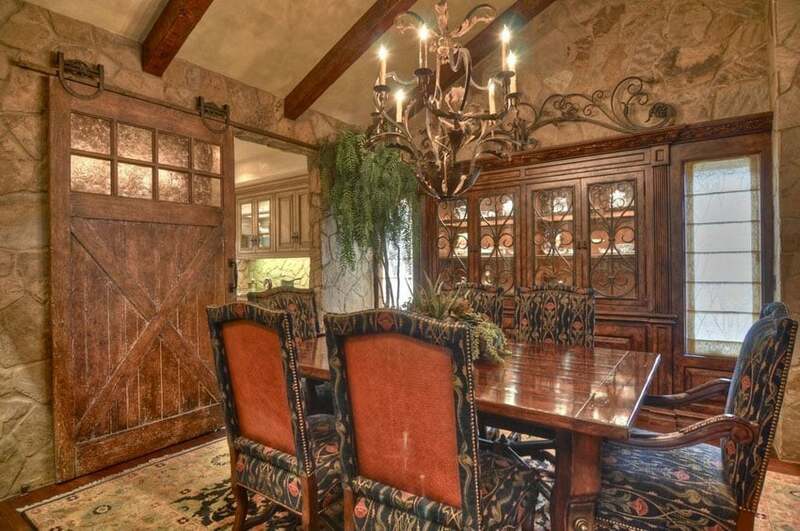 The scone lighting wall fixture and the crystal chandelier adds elegance to the design scheme. A contemporary five panel semi-acrylic sliding barn door made from dark tone alder wood using a micro round, modern raw finish barn door hardware adds elegance to a rustic look; bringing a modern feel to the vintage. A perfect mobile partition for the formal living room and hallway. Medium hardwood flooring which extends throughout the house adds warmth and contrast to the design and color scheme. These frameless laminated safety glass sliding doors fitted with stainless steel hardware, give this home a contemporary twist and transforms the look of both the foyer and living room area. The sandblasted two-tone glass is perfect for adding privacy while still letting light comes in, making both areas brighter and features an elegant accent design. Period style inspired master bedroom features a four panel knotty hardwood sliding door in dark tone finish with heavy vintage strap barn door hardware and iron door pull handle. 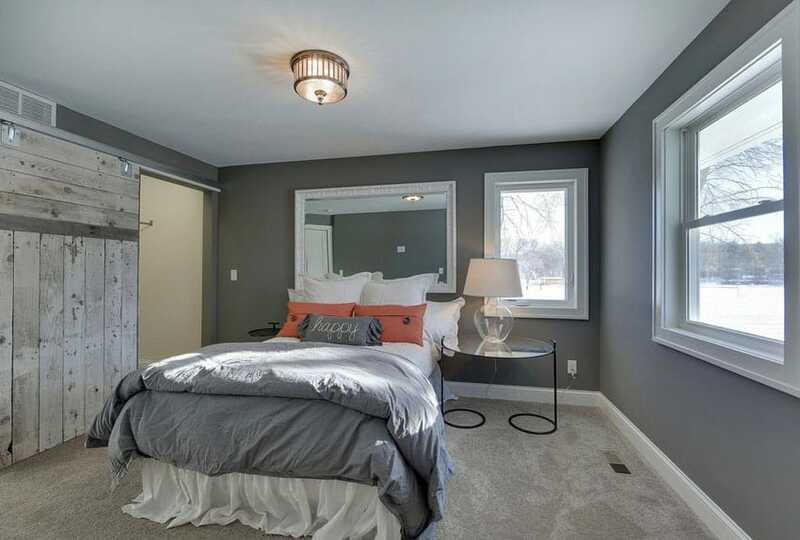 Medium tone hardwood flooring and neutral brown color palette completes this elegant master suite bedroom. 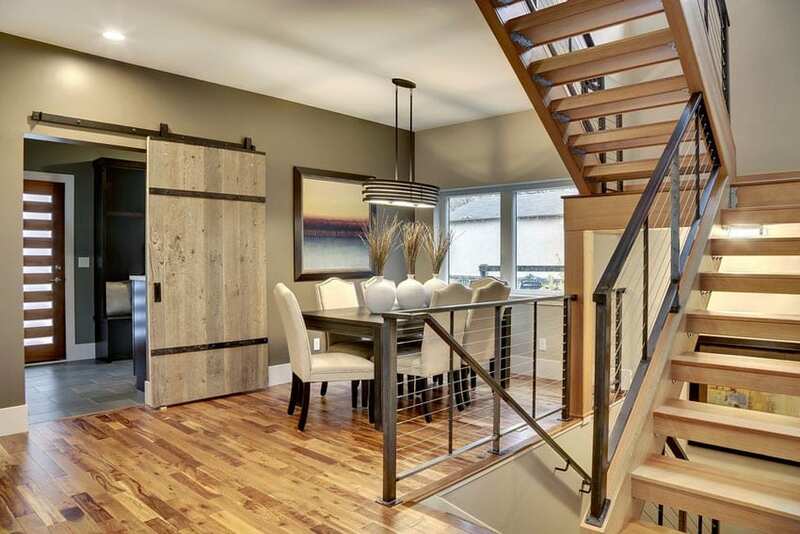 This open concept hallway could have just left an open entryway, but instead features reclaimed hardwood sliding barn door to add more privacy and visual interest to the design scheme. By incorporating the sliding door, it helps maximize different uses of the space without limiting or confining traffic through other parts of the house. A sliding barn door which perfectly fits this modern kitchen by combining functionality and design. White painted hardwood door frame, this space saving five-panel glass sliding barn door can be pushed to one side to access extra pantry storage space for canned goods, dinnerware and glassware. 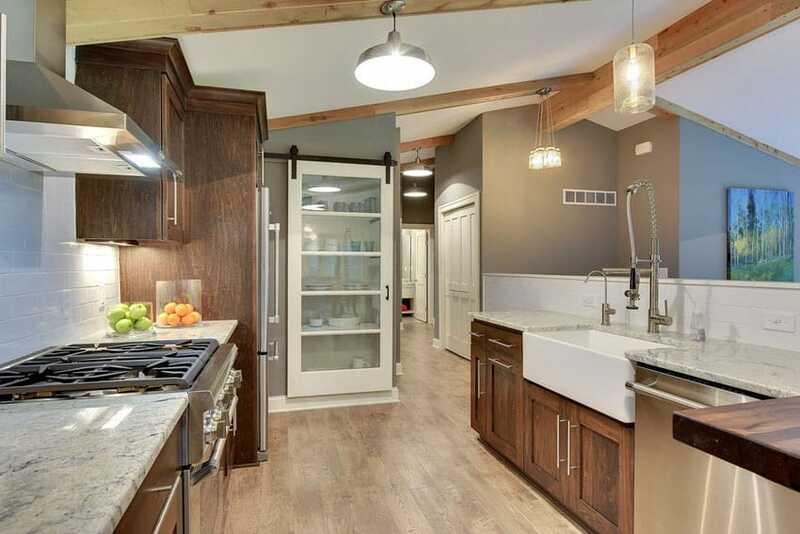 When you are thinking of renovating your dated kitchen – keep in mind – space saving sliding barn door. 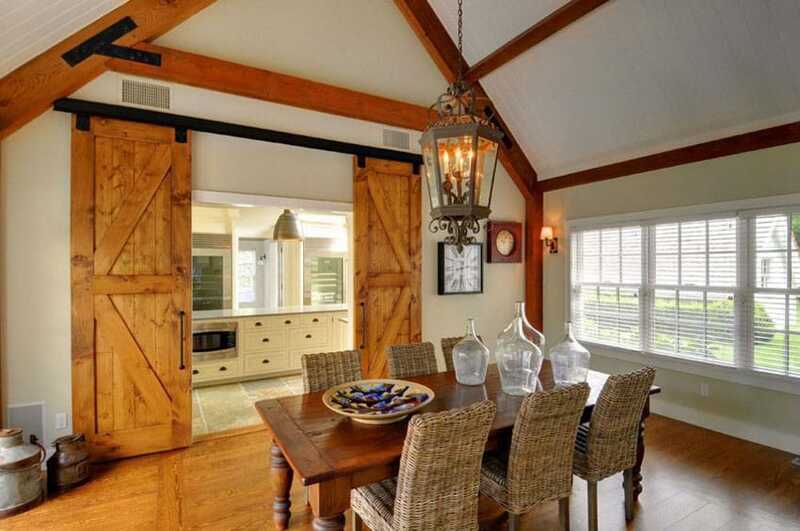 A sliding barn door can blend seamlessly to this dining room area, giving it a sophisticated and elegant look. This craftsman sliding barn door has 8 panel frosted acrylic glass on top and combined with a classic X panel at the bottom. 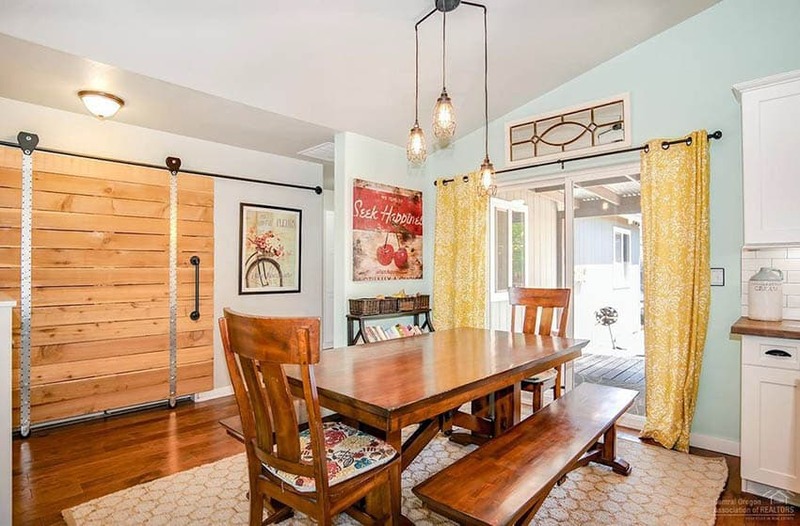 Additionally, this barn door features a custom built hardware which goes well with the iron works found in this dining room. 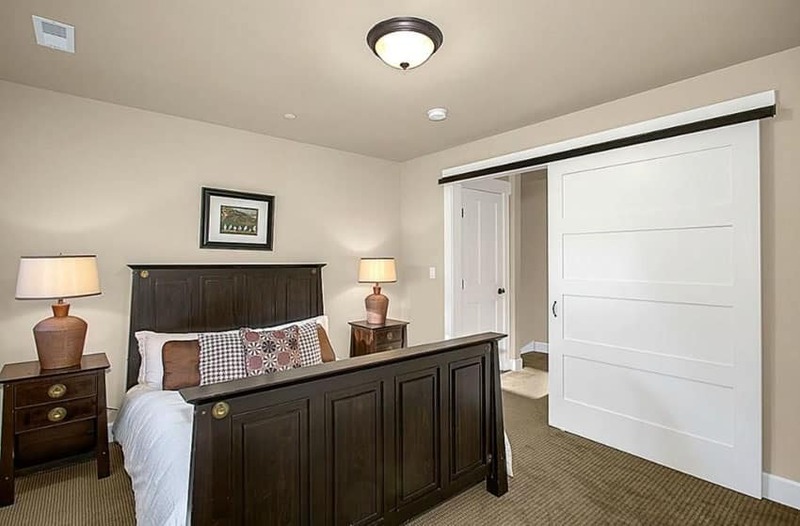 A modern sliding barn door maximizes the space in this master suite. By incorporating a frosted glass door, allows light to flow from both bathroom and bedroom; and at the same time provides privacy. Top mount barn door hardware works perfect with the custom stainless steel valance which conceals the barn door hardware from view, for a more modern look. 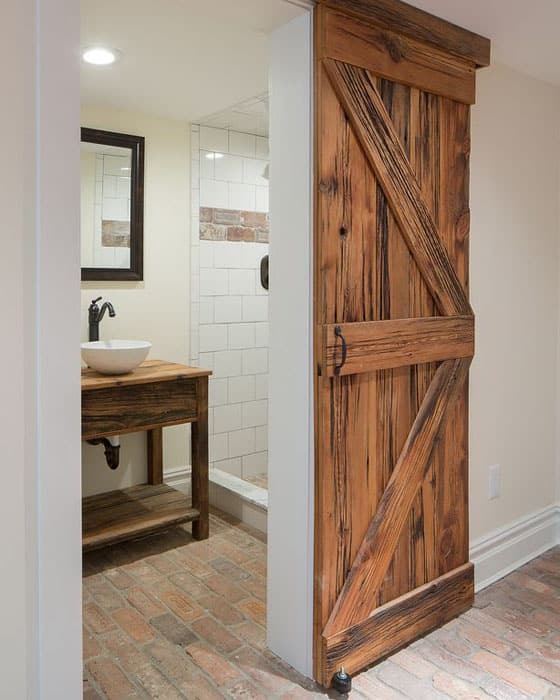 This rustic inspired design scheme features a Z sliding barn door made from reclaimed lumber in medium tone finish and extends to the custom made bathroom sink counter. An amazing way to save space with a touch of style. The design also incorporates brick flooring to complete the rustic design scheme. 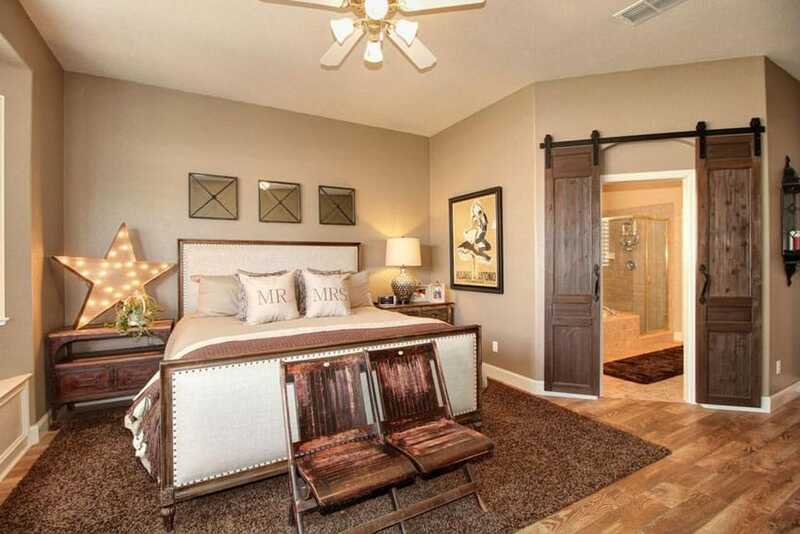 Double dark tone solid hardwood sliding barn door with a classic stainless steel barn door hardware and door pulls works perfectly for this modern master bedroom. It highlights the entrance to an elegant master suite bathroom combining privacy and functionality. Choosing to feature a six panel double sliding door, saved a lot of space instead of using the traditional swing-out doors. 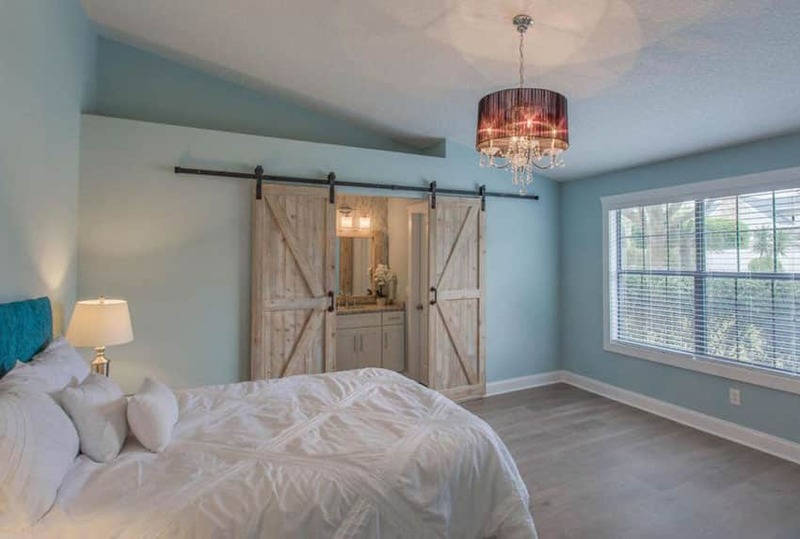 By using a vintage type of barn door hardware it draws the attention providing a focal point to the room. 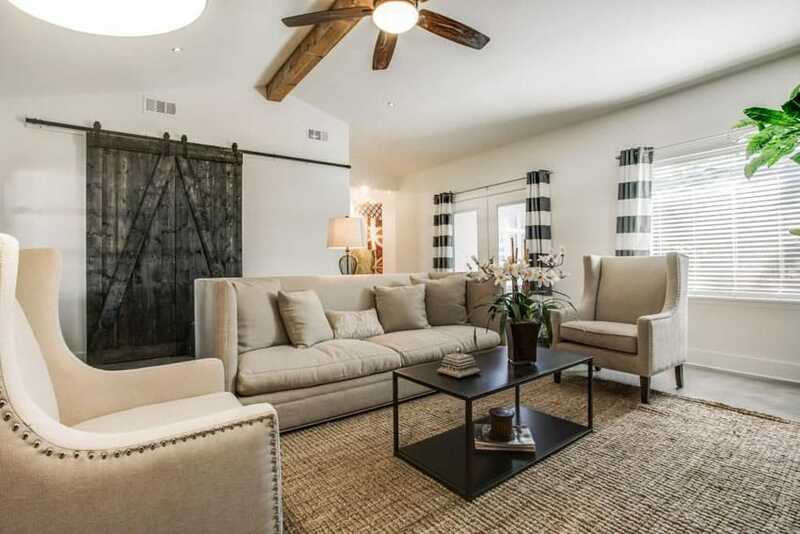 Fully embracing the look of sliding barn doors this living room features two doors. The doors offer a traditional pattern and are painted a light brown to match the bar stools in this living room’s home bar and flooring. Wanting to hide that home office behind a closet door when not in use? By adding a two panel knotty hardwood sliding barn door which functions as a movable partition between bedroom and home office space. 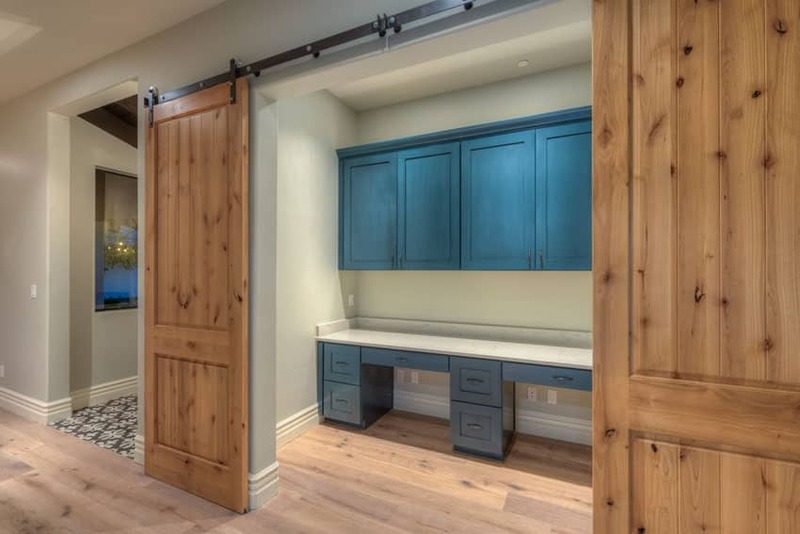 This sliding barn door opens up both ways to reveal a study or office area and closes for a more private time. Built-in cabinets provide plenty of room for storage. 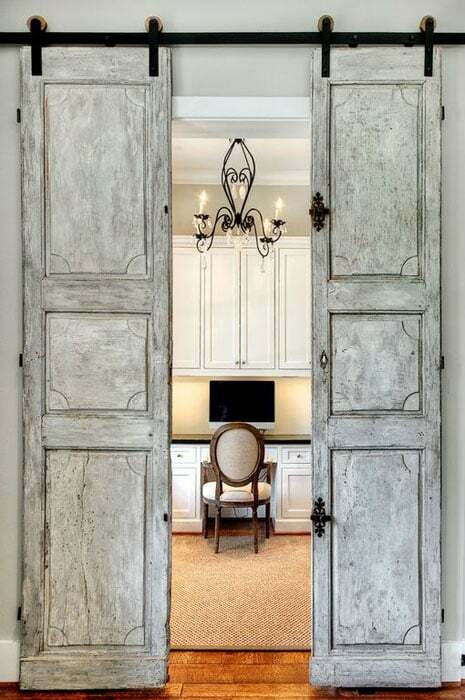 Both stylish and rustic, this three sliding barn door reveals an entry to a quiet desk space in this country home. Rich medium tone hardwood floors, wood paneling cabinetry and a granite countertop adds luxury and elegance to both rooms. 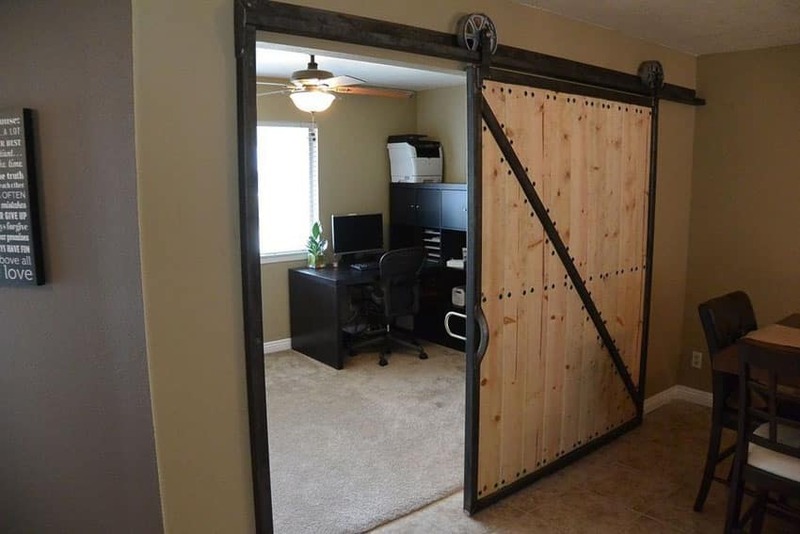 A vintage reclaimed sliding barn door with top mount raw finish barn door hardware creates a rustic look perfect for this home office space saving partition. The Z door frame is made of raw finish steel which incorporates a custom made door pull. A natural finish for the reclaimed wood balances the rustic look of this sliding barn door. For even more ideas, check out our gallery of interior door designs.